SO, I will blog! It’s been a while since I’ve done this. I just moved out of the dorms yesterday (woooohoooo! They were not nice.) and am staying at a friend’s apartment in a different neighborhood close to campus (she’s away in Turkey. Cool, huh?!) For the FIRST time since I’ve been in Israel, I woke up this morning with the very real sensation that I am living in another country. I look out of the bedroom window and I see uniform concrete buildings in the background; smaller, flat roofed concrete houses are in the foreground along with some blue construction tarps, a few small cars, garbage dumps in the parking lot, a few palm trees and one giant tree, whose variety escapes me. There’s also a few electrical towers, TONS of sand, and a big, big, blue sky enveloping everything. This, my friends, is Be’er Sheva in a nutshell. And it’s been my home for almost half a year now. I decided to go to Jerusalem. This wasn’t as hyped up as it sounds. I think Jerusalem gets really crowded on Easter (obviously) but it was pretty empty on Monday afternoon, December 24, when I arrived via bus. First thing I did was go to the Old City with my friend Kurt, to see if we could get tickets to a Christmas service that night at the Lutheran Church of the Redeemer. Did I mention that the service was in German? This was the first interesting thing I did. I had originally planned to attend a “unitarian” service of sorts at some big church somewhere near the Old City, because it had the subtitle “multilingual,” which to me equaled English! 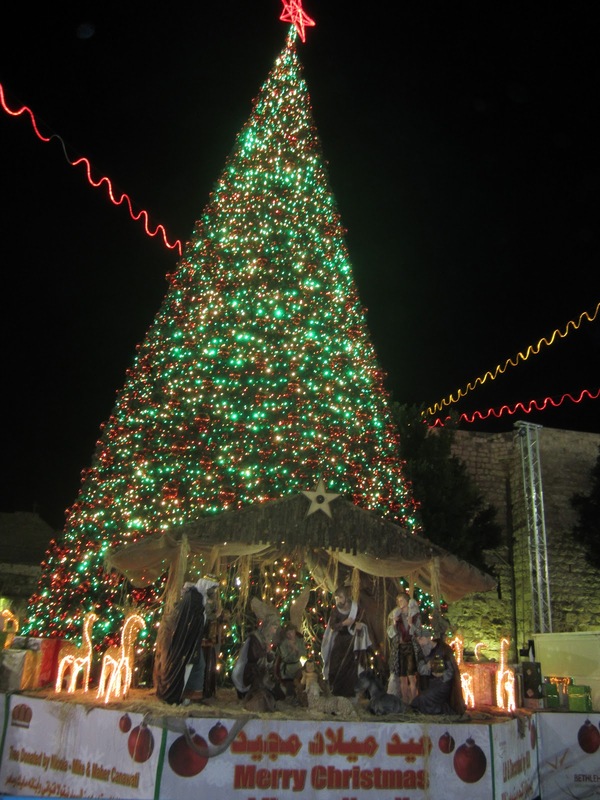 No Orthodox services were held on the 25th, because every Orthodox church in Israel is Old Calendar, so there would be no “Thy Nativity, Oh Christ our God…” for me. BUT wait until I tell you the rest. Kurt and I weren’t sure if we would be let into Church of the Redeemer. They had stopped giving tickets and we were told that if we came back in a few hours we might be able to find some standing room in the back. Okay, no harm done. We both wanted to be at service. Kurt told me that in Germany he sometimes goes to four services on Christmas day, just to hear the carols. Cool, huh? So, we had a few hours to spare in Jerusalem. What does one do in the Old City for a few hours? Pray and shop and go up on the roofs of old buildings. Seriously. We went to the Church of the Holy Sepulchre (erected by Sts. Constantine and Helen in the 300s) and–it was so quiet! The last time I had been to the Church, it was Saturday, in the middle of the day, and it was miserably crowded. But because it was the evening, and on a Monday, there was scarcely anyone inside. So what did I do? 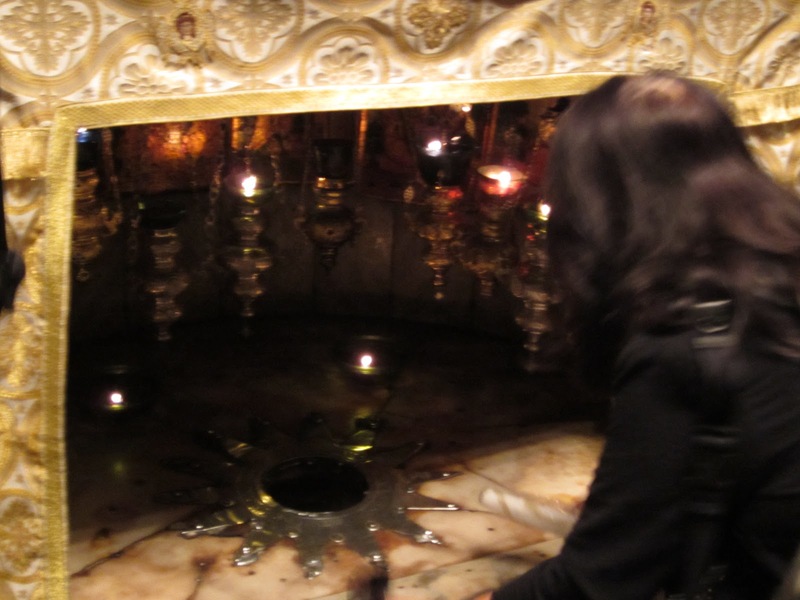 I walked quickly toward the tomb to go inside and venerate the stone. I made it, but not before an angry monk started shouting at me to keep moving. Needless to say it was not the spiritual experience one expects when venerating such sacred objects, but I knew that, because last time at the Church I felt similarly…like a stuffed sardine waiting to be healed! But then when I feel like this I always think of Zachaeus and how he climbed a tree just to see Jesus above the crowds. Where’s a good, sturdy tree when you need one? Anyway, after a bit of shopping (that’s another perk of not being home for Christmas–you have so much more time to buy presents!) we ended up at a bar with some friends, toasting on Christmas Eve. This was also strange for me. I’m used to fasting and (trying to) nap on Christmas Eve…but we gathered at a table around an outdoor heater, I drank hot mulled wine (!!!) and somehow, it felt good. After this, Kurt and I went back to the Church to see about getting into the service. Did I mention that Kurt is German? He totally played the “we’re both from the same country” card and got us inside, but there were plenty of open pews even after the service started. Ever wondered how long it takes one to walk from Jerusalem to Bethlehem? No? That’s okay, I’ll tell you anyway: two and a half hours, plus stops for singing. Yep! 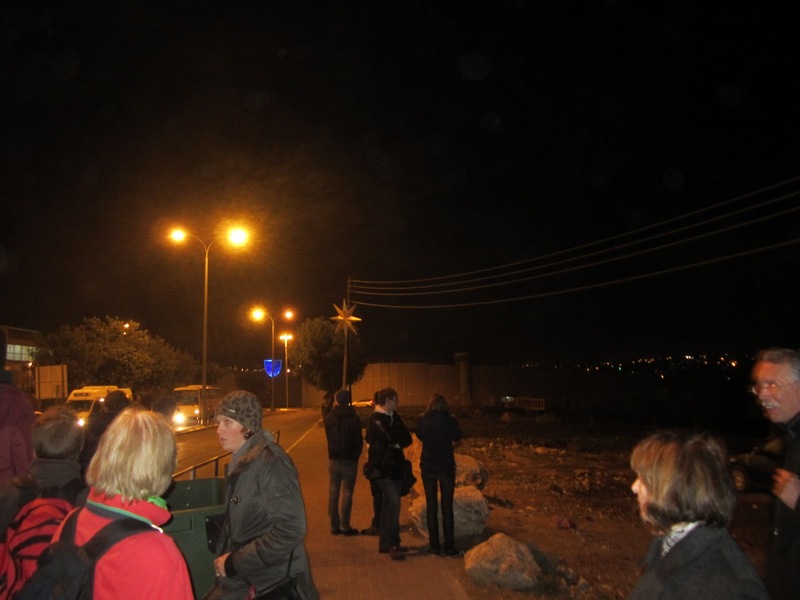 Me, Kurt, Krystoff, and Paul joined a group of about 100 from the service on a midnight walk to the place of His birth…I really can’t believe this. I will try to describe the experience without sounding like a Hallmark card or the 700 club, but please forgive me if I cheese out a bit…. See that giant concrete wall in the center of the picture? Click to enlarge the photo. 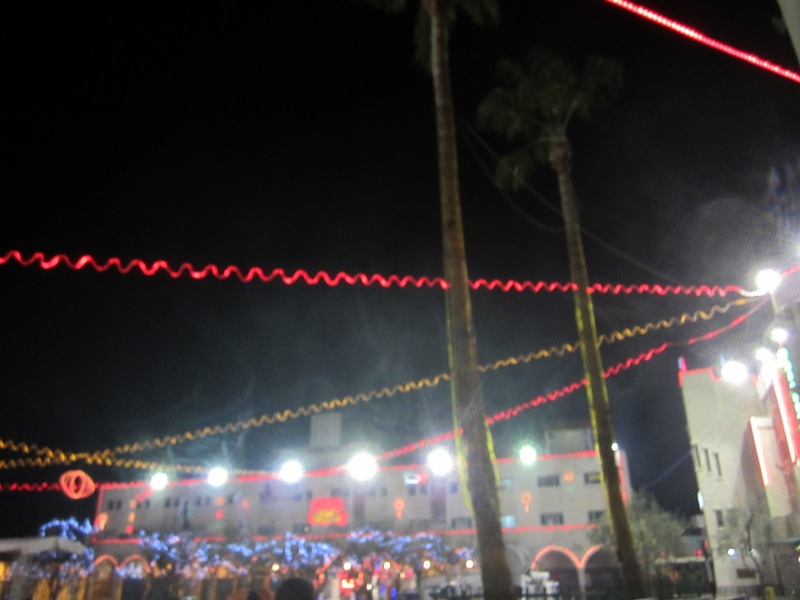 It’s a giant concrete wall, with a security tower in the middle, and it passes through the middle of the street. It’s “THE WALL!” About five years ago, the Israeli government decided to build this wall dividing Israeli Jerusalem from Palestinian Bethlehem. So what do pilgrims do? Never thought I’d say that sentence. Watching this video again makes me inexplicably sad–sadder, I think, then I felt when I was there. 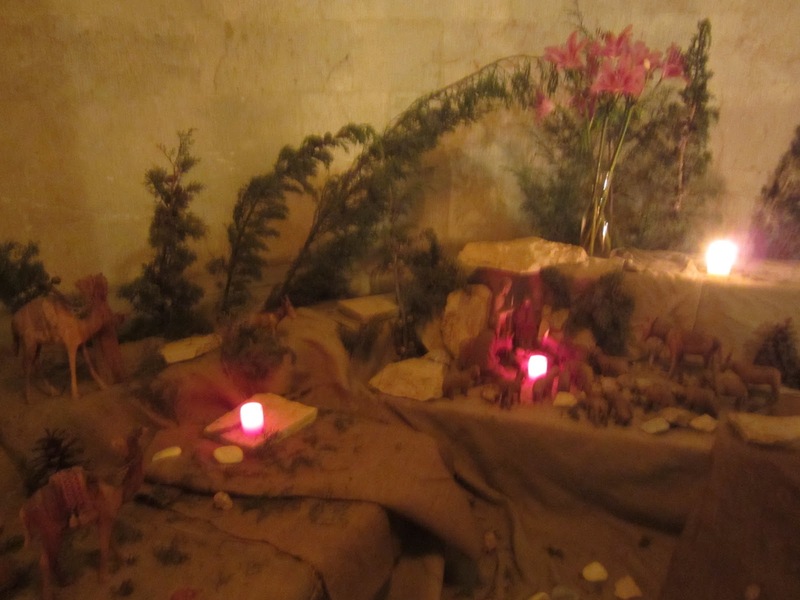 I was too overwhelmed to understand what I was feeling then, because our walk continued away from the tumultuous wall and into Manger Square, where everything was warm and fuzzy again. The best is till yet to come, though I apologize that this post is turning out to be so long. We went into the Church of the Nativity, mostly to get warm, but ended up staying there for quiet some time (it was about 3 am at this point…). I walked down into the Grotto where the star is placed over the spot of his birth. It looks like this, pictured at left. When I climbed down into the grotto, I was astonished (though thinking back on it, it makes sense) to see SO many people down there, even at 3 am! 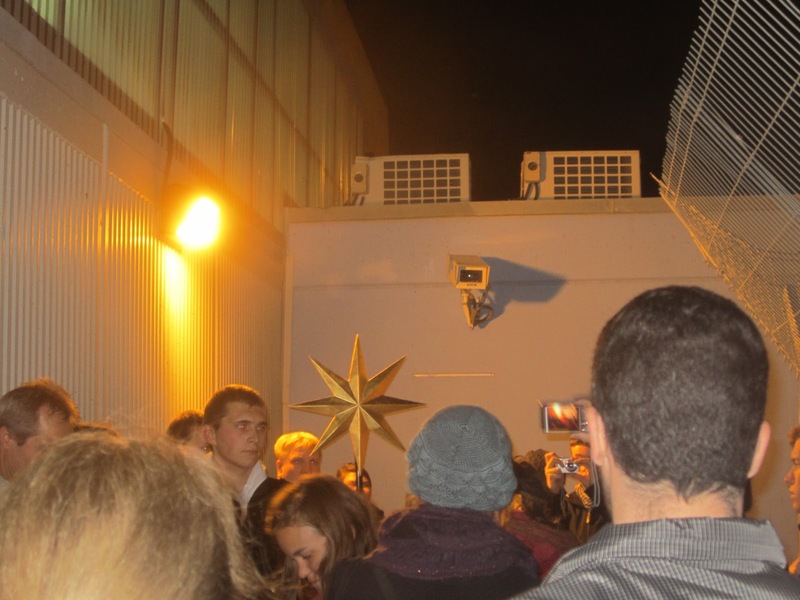 There was a Catholic service being conducted, and people were gathered around this humble little star, kneeling and praying. I was in awe. I couldn’t really move and just stared at this star, picturing a tiny little baby curled up and sleeping inside. What Kings and Shepherds felt that day, here I was standing in their footprints. It was surreal. Remembering it now, I feel very funny inside…that’s all I can say. I probably shouldn’t try and describe it because I can’t.